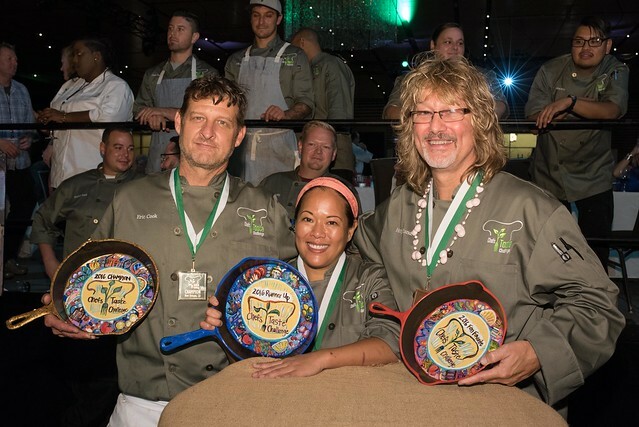 Chef Eric Cook of The American Sector Restaurant was named Champion at the 2nd annual Farm to Table Chefs Taste Challenge (CTC), which took place August 19, 2016 at the New Orleans Ernest N. Morial Convention Center. His winning creation was “Sugarshine Glazed Gulf Shrimp and Texas Green Squash Cassoulet” which featured Whole White Gulf Shrimp, Praline Rum, and Green Squash. Chef Lee Anne Wong of KH Restaurants, Honolulu, HI took home runner-up honors for her dish, Thai Style Fried Quail, Heart of Palm, Mayhaw Chili Glaze. Chef Henry Chandler of Henry’s Louisiana Grill, Acworth, GA won the “Fan Favorite,” as decided on by the attendees, for his dish, Farm Boy’s Feast, which featured Braised Beef Inside Round with Mushroom and Chickpea Saffron Risotto. Chefs Taste Challenge Sponsors generously donated additional products for the event: Organic Wine – Bonterra; Beer – Lazy Magnolia; Chef Plates and Favors – Earthborn Studios; Cutting Boards – John Boos Co.; Chef Jackets – ChefWorks; Student servers – Café Reconcile. The Chefs Taste Challenge is produced by the New Orleans Ernest N. Morial Convention Center and is held in conjunction with the Farm to Table Experience, which took place August 18-20, 2016. F2Te explores the cultivation, distribution and consumption of food and drink sourced locally to globally. For more information on F2Te, please visit f2texperience.com. Chefs Taste Challenge Champion, Eric Cook of New Orleans, LA; Runner-up Lee Anne Wong of Honolulu, HI; Fan Favorite Winner Henry Chandler, Acworth, GA.